New York City and Boston are situated on the Eastern seaboard and attract millions of tourists from around the world each year. Boston's Colonial roots mark it as the "Cradle of Liberty," while New York City's Statue of Liberty was the first sight many immigrants saw as their ships sailed toward Ellis Island. But, that's where the similarities end and the delightful differences begin. Boston views itself through the lens of blue-collar pride; it's a collegial, down-to-earth destination that never takes itself too seriously. New York, on the other hand, prides itself on being a busy, bustling hub of culture and arts running over with sophistication. While New Yorkers revel in moving forward at a faster pace, Boston natives enjoy the quaint charm of their city — they don't call Boston "The Walking City" for nothing. 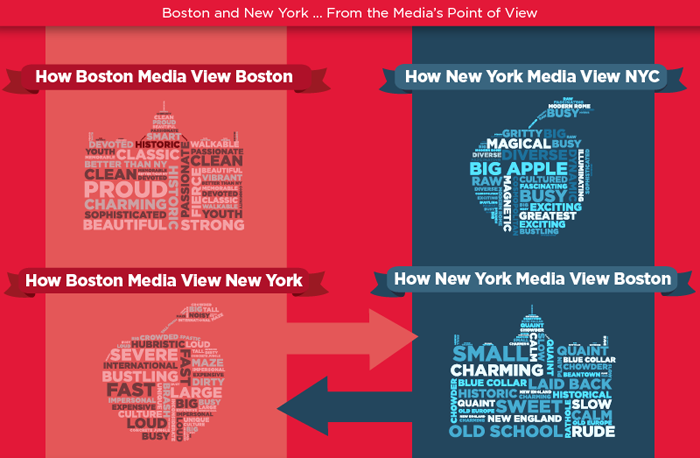 CityPASS recently conducted a poll among prominent writers in New York City and Boston, seeking to get their impressions on these two great cities, as well as the best of what these destinations have to offer to tourists with desires to visit Boston or New York, and locals alike. Let's take a tour of the results, shall we? The best time to visit Boston is from late May (or early June) to October. In the summer, Beantown streets are flooded with locals enjoying the sunshine as they browse posh Newbury St. shops or stroll past the Prudential Center. During fall months, tourists may enjoy scenic views from the Boston Skywalk as New England leaves change from vibrant shades of green to chestnut brown. Although the best time to visit Boston is distinctly mid-year, the best time to visit New York is year round. In the summer, there are endless opportunities for sightseeing in New York. In the winter, tourists can sip hot cocoa while enjoying serene snowfall views from the Empire State Building- the world’s tallest office buildings. Whether it’s a visit to New York or a visit to Boston, you’re sure to have a good time with a few pointers from us at CityPASS. Both New York and Boston are known for teams with rowdy reputations and equally rambunctious fans who get into the game as much as the players. The Bostonians and New Yorkers we polled almost unanimously agree that MLB player Derek Jeter is the most famous athlete from NYC. While both cities' sports fans can agree that Jeter is renowned and beloved, 63% of Boston fans are quick to say that Jeter's Yankee bullpen mate, Alex "A-Rod" Rodriguez is the most loathed athlete to play in New York. Roughly 36% of Boston bloggers polled said that the Red Sox's David "Big Papi" Ortiz was the most recognized Boston athlete. Conversely, 50% of New York bloggers polled said that Ortiz was also the most disliked athlete from Boston. You can't win ‘em all! Speaking of wins... How do Boston and New York stack up in terms of their respective teams putting up the numbers? Boston has a history of excellence among its sports teams, packing a total of 36 wins in Beantown's collective trophy case. The Boston Celtics lead the pack with 17 NBA titles to their credit. The wins stretch from 1956 through the Larry Bird-led dynasty of the 1980s to the new millennium. There's a competitiveness among New York City sports teams that often splits residents' loyalties straight down the middle. 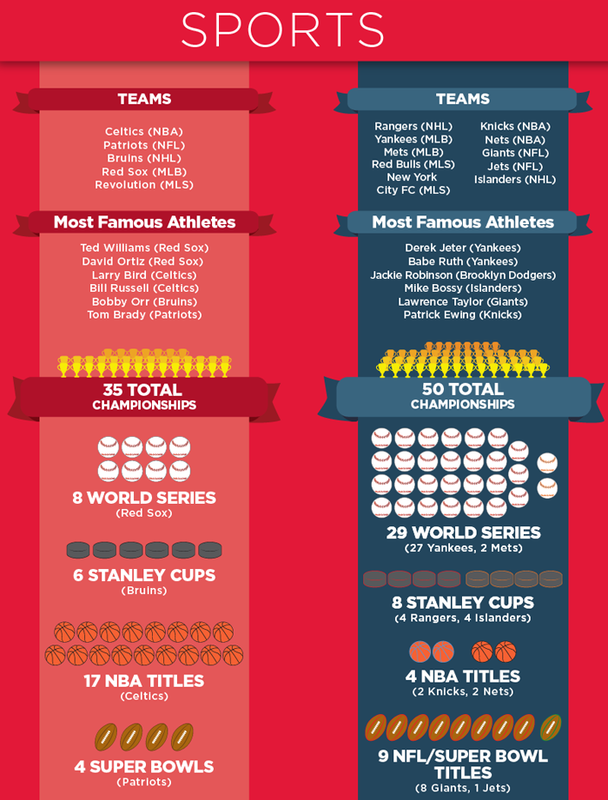 NYC has not one but TWO teams in each of the major leagues and 50 sports championship titles in the record books. The Yankees are responsible for 27 of those titles. On the flipside, the NY Mets, the city's other Major League Baseball team (with no less of a loyal following of its own), have scored two World Series titles. 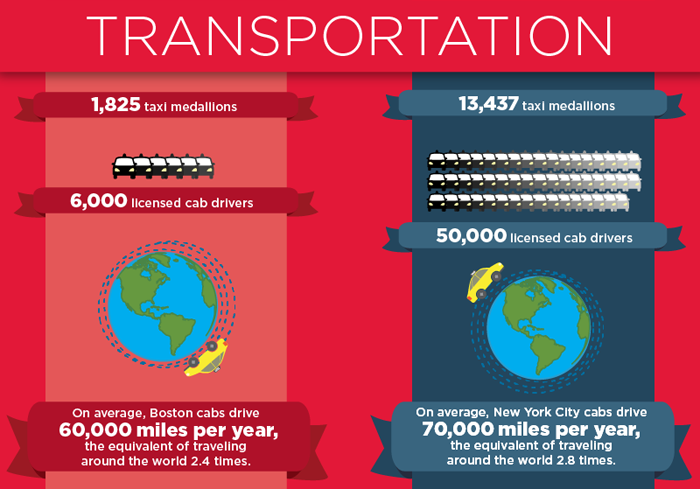 There are more than 1,825 taxi medallions in Boston, and its 6,000 licensed cab drivers clock an average 60,000 miles per year -- the equivalent of traveling around the world 2.4 times. In terms of public transportation, Boston has over 4.5 million weekly riders on its transit system and a staggering 237 million riders each year. There's a lot of turf to cover in Boston, but "The Walking City" has only a fraction of the volume of transportation that New York sees. NYC has more than 10 times the number of taxi medallions and drivers as Boston, with 13,437 medallions and 50,000 drivers crisscrossing the streets of the five boroughs. Each NYC taxi driver travels and average 70,000 miles per year — a bit more than the Boston drivers' 60,000-mile average. Beneath the city streets, New York has 842 miles of subway track that carry 11.2 million riders to their destinations each week. Annually, New York's subway system has a staggering ridership of over 1.7 billion -- that's more than three times the actual population of the United States! The Cradle of Liberty attracts over 19 million tourists each year, clamoring for Boston's unique mix of rabble-rousing history and present-day salt-of-the-earth atmosphere—not to mention the city's surrounding coastlines in the summer and stunning foliage in the fall. Standing as "Boston strong" examples of both, more than 27% of those polled recommended historic Faneuil Hall and MLB stadium Fenway Park as the top attractions for tourists to see. Fenway Park takes the lead as a beloved Boston must-see, according to several blogs, including Wicked Cheap Boston and A Noted Life. Boston is also home to a number of intriguing museums. The Museum of Science is viewed as a must-visit with a number of great exhibits for kids, as is the Isabella Stewart Gardner Museum. Leigh Harrington of WhereTraveler.com recommends this off-the-radar museum, which houses a collection of international art curated by its philanthropist namesake. And for beautiful blooms at any time of year, don't miss the Harvard Museum of History's glass flowers exhibition! Writer Maria Lisella refers to New York City as a "Modern day Rome." Like the ancient city, this modern metropolis has no shortage of sights to see, either. Among the bloggers we polled, Angela of the New York-Boston food blog Foodies At Work insisted that visitors take a gander at the Gotham skyline from the Top of the Rock Observation Deck at midtown Manhattan's Rockefeller Center. Author and journalist Jeryl Brunner recommends catching a show on Broadway or seeing a live performance at Lincoln Center. Times Square, the site where many folks choose to ring in the New Year, is another popular destination for tourists. Barring its penchant for baked beans, Boston is known for some of the best seafood in the United States. One of its signature dishes is the lobster roll, a split bun filled with lobster meat soaked in butter. New England Clam Chowder is a creamy local delicacy tourists should try in its native setting. As for dining establishments that offer a slice of Boston to savor, locals recommend stopping by such hidden gems as Sam LaGrassa's sandwich bar (thanks for the heads up thebostonattitude.com) and Eastern Standard Kitchen. Bostonians also suggest tourists throw back a beer or two at one of its famous sports bars, such as Cheers (yes, the one from the TV show) and The Fours (here's lookin' at you Jogging Concierge). In terms of food favorites, pizza is the lifeblood of New York City. It's no use asking "Which is the best pizza joint in NYC?" because, depending on which borough you're in and which corner you're on, you'll get no less than 10 different answers. While it may not have the fishing community that Boston has, New Yorkers still love their seafood, too. 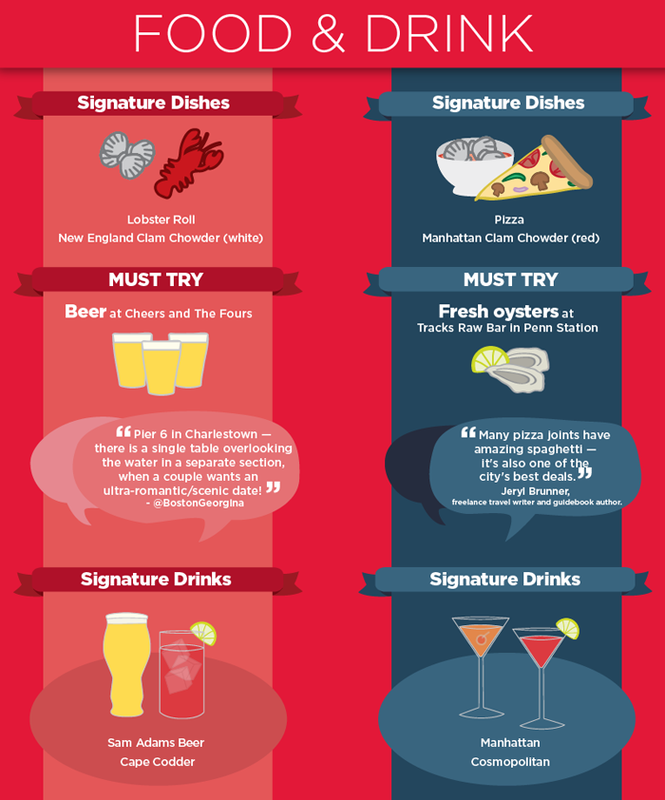 In addition to trying out some Manhattan Clam Chowder (the red kind), visitors to the city may want to enjoy fresh oysters at Tracks Raw Bar in Penn Station, as recommended by Sean of MurphGuide.com. In a city so big, it's hard to go wrong. So, what's your style? Are you drawn to the nonstop, 24/7 energy of sophisticated New York, or do you prefer the smaller, walkable style of historic Boston? Here's our full graphic showing some of the more interesting stats for each city. Which is your favorite to visit and why? So what are you waiting for? CityPASS offers discounted admission passes to see the best attractions Boston has to offer, as well as discounted tickets to New York attractions. Wherever you ultimately decide to visit, make the most of either city with CityPASS tickets today!